"Has everything you’ll want from a great cat fountain." "It has a simple design and affordable price tag." "Tends to stay far cleaner than other cheaper fountains." "Boasts an all-ceramic design that’s easy to clean and hygiene-friendly." "This fountain features triple filtration to keep water fresh." "The submersible pump is designed to be as quiet as possible." "Tiered waterfall provides a solo drinking station at three different heights." "Some cats prefer this design and it’s easier to clean." PetSafe’s Drinkwell 360 has everything you’ll want from a great cat fountain—although as the name implies, your canine friends are more than welcome to indulge as well. It has 128 ounces of water capacity and has multiple streams, making it extra-enticing to your pet and easy for multiple cats to take a sip. It includes a replaceable carbon water filter that keeps the water fresh-tasting, and a control cap allows you to customize the flow. It’s also easy to clean and dishwasher-safe. Customers write that the PetSafe Drinkwell 360 is incredibly easy to set up and runs quietly, while the 360, the multi-stream design makes it a great choice for owners of multiple pets—you can even choose the number of streams (between one and five) for an extra level of customization. If you’re looking for a great all-around fountain, this is the one. While there are plenty of pricey, high-end cat fountains on the market, buying one doesn’t have to put a dent in your budget. Even at its largest size (four gallons), the Aspen Pet Lebistro Auto Gravity Waterer will cost you just over $20. And while it’s not as tricked-out as some of the other fountains here, it’s still a great way to encourage your cat to stay hydrated. It has a simple design, with a spill-resistant bowl and a bottle reminiscent of an office water cooler. The bottle slowly refills the bowl as your pet drinks, keeping the water in their bowl fresh throughout the day. The bottle can be easily removed for cleaning—and since it’s clear, it’s easy to know when it’s time for a refill. Customers write that the Aspen Pet Lebistro Auto Gravity Waterer is well designed, with weight evenly distributed so pets can’t accidentally topple it over. It keeps the perfect amount of water in a pet’s bowl, saving owners the trouble of constantly reminding themselves to refill it. With a sleek design and quality materials, the PetSafe Drinkwell Sedona looks the part of a high-end cat fountain. Built to draw in oxygen and inhibit bacterial growth, it’s both stylish and highly hygienic. The fountain has 100 ounces of water capacity—enough to keep multiple cats happy, with enough room in the bowl to accommodate a few thirsty pets. It also features ultra-quiet operation and a carbon water filter that keeps the water fresh and odorless. Customers write that the attractive design of the PetSafe Drinkwell Sedona goes more than skin-deep. It tends to stay far cleaner than numerous cheaper fountains, thanks in part to the device’s two-step filtration process. The bubbling ceramic tower in the center also keeps cats interested and eager to return for a sip throughout the day. While the design of our high-end pick is part-ceramic and part-plastic, the Drinkwell Pagoda Pet Fountain goes a step further with an all-ceramic design that’s easy to clean and hygiene-friendly. Holding 70 ounces of water, the Drinkwell Pagoda fountain constantly circulates its contents to prevent bacteria growth and keep pets drinking. The submersible pump ensures quiet operation, and the replaceable carbon filter keeps things fresh. Meanwhile, dual streams make it easy for two pets to drink at once, and an elevated drinking dish makes it an especially great pick for seniors. Available in four colors (white, red, taupe, and blue), the Drinkwell Pagoda Pet Fountain wins raves from customers for its design and overall cleanliness, thanks to its all-ceramic construction. It’s also easy to set up, and reliably encourages cats to stay hydrated throughout the day. While many cat fountains include some kind of filtration system, the Veken Automatic Pet Fountain’s is a cut above the rest. This fountain features triple filtration that uses layers of cotton, activated carbon, and ion exchange resin to keep water fresh even when being cycled through the fountain for an extended period. The fountain also allows you to customize the water’s flow, with bubble, waterfall and stream modes to select from—play around until you’ve found the one that’s most enticing to your pet. The Veken Automatic Pet Fountain holds 84 ounces of water and runs quietly. Customers add that the flower-inspired design is easy on the eyes and appealing to cats. But more importantly, they don’t have to worry about the quality of their pets’ drinking water while away from home. Looking for a cat fountain, but don’t want to live with a constant background of pump-related gurgling? 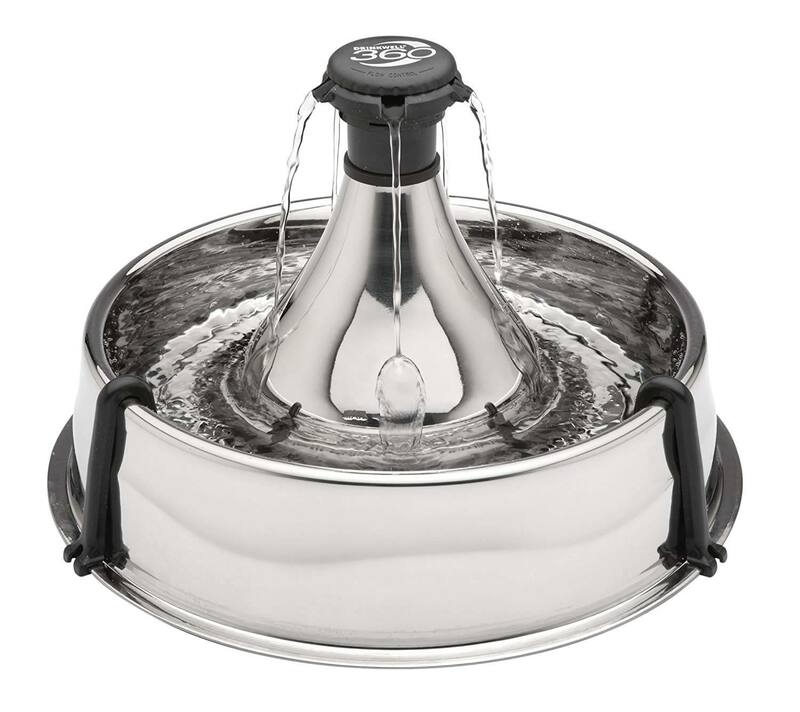 There are plenty of fountains out there that run almost silently, and the Mospro Pet Fountain is one of our favorites. The submersible pump is designed to be as quiet as possible, so it won’t disturb you or your pets during operation. The machine is also low-consumption and can operate for a staggering 10,000 hours. It also features three flow settings, activated carbon filtration and two liters of capacity. Owners say the Mospro Pet Fountain is easy to assemble and noticeably quieter than other fountains. Sometimes—on top of irritating the resident humans—loud motor noises can unsettle cats and discourage them from drinking from a fountain. If that’s been an issue for you, this super-silent cat fountain is just the ticket. For owners of multiple cats, there’s no need to purchase separate fountains for each of your pets. Instead, choose one that’s designed for sharing, like the Cat Mate Pet Fountain. Its unique design breaks from the norm, with a tiered waterfall that provides a solo drinking station at three different heights, so your cats can get their fill without getting in each other’s way. Don’t worry about splashing—this fountain uses ramps to eliminate spillage as water flows from one level to the next. It also runs quietly, with an isolated pump system and low-voltage power supply, and uses a polymer-carbon filter for water purification. The Cat Mate Pet Fountain holds 70 fluid ounces of water and easy-to-clean plastic construction (the bowls are dishwasher-safe). Customers write that their cats were instantly intrigued and quickly got the hang of the tiered design, drinking from all three levels with their friends. Some note that it requires slightly more proactive cleaning than other fountains, with most recommending a rinse and fresh water every few days. Rather than using a stream or waterfall-like trickle, some cat fountains simply use a bowl placed on top of a wider base. Some cats prefer this design, and it also has the benefit of maximizing oxygenation thanks to a larger water-to-air drinking surface. The Catit Top Drinking Fountain is our favorite in this category, with its attractive stainless steel bowl and easy disassembly for cleaning. The fountain holds 64 fluid ounces of water and has a replaceable carbon filter. Meanwhile, its recirculation system prevents bacteria growth and keeps your cat’s water fresh and cool. Customers write that the Catit Top Drinking Fountain is an incredible product, encouraging their cats to drink up to 10 times as much water as they did previously—a huge benefit if your pet has a kidney issue, for example. The motor is practically silent, and the stainless steel makes it easier to clean than many other models. Our writers spent 2 hours researching the most popular cat fountains on the market. Before making their final recommendations, they considered 30 different fountains overall, screened options from 8 different brands and manufacturers and read over 50 user reviews (both positive and negative). All of this research adds up to recommendations you can trust.